Machu Picchu (Quechua language: Old Mountain; sometimes called the "Lost City of the Incas") is one of the most well known sites of the Inca Empire. The ruin, located high in the Andes Mountains, forgotten for centuries by the outside world, was brought to international attention by Yale University archaeologist Hiram Bingham, who rediscovered it in 1911. It is one of the most important archaeological centers in South America, and as a consequence, the most visited tourist attraction in Peru. Since 1983, the site has been designated as a UNESCO World Heritage Site. Theories of its use vary. Bingham initially claimed it was a sanctuary for Sun Virgins; the famous Intihuatana ("hitching post of the sun") and elevated location led to ideas of astrological and spiritual purposes; others regard its natural beauty as suggesting it was used as a country retreat for Inca nobility. It was abandoned at the time of the Spanish invasion of Peru, although whether the Spaniards discovered it at that time is debatable. Regardless of its actual purpose, Machu Picchu remains an incredible combination of natural beauty and human creativity. On July 24, 1911, Hiram Bingham III, an American archaeologist from Yale University, was searching for Vilcabamba, the last stronghold of the Inca during the Spanish conquest of Peru. While exploring the area around Cuzco, the ancient capital of the Inca, he came across some local farmers and was led to the ruins by their ten-year-old son. Funded by National Geographic and Yale University, Bingham and his team made several more trips and conducted excavations on the site through 1915, taking thousands of photographs of the ruins and writing a number of books and articles about the findings. Through agreement with the Peruvian government, Bingham borrowed hundreds of artifacts to bring back with him to Yale, agreeing on paper to return them 18 months later. In 1916, Bingham even wrote a letter stating that "they do not belong to us, but to the Peruvian government, who allowed us to take them out of the country on condition that they be returned in 18 months." Despite a seemingly cut and dry breach of the original contract, Yale refused to return the artifacts, citing overlapping civil codes and statute of limitations, pointing out their excellent preservation of and research on the collection, and claiming that their exhibition of the artifacts generates interest in tourism for Peru. Archaeologists believe the city was built around 1450 by the ninth Sapa Inca (1438-1471/1472) of the Kingdom of Cusco, also the first Imperial Ruler of the Inca, Pachacuti Inca Yupanqui (also called Pachacutec), and was only inhabited for approximately one hundred years, abandoned around the time of the Spanish invasion of Peru in 1532. The intended purpose of the city has been a matter of debate, particularly since the Inca kept no written records. Initial research done by Bingham's team showed a male to female ratio of more than four to one, leading to the widely held belief that Machu Picchu may have been a training ground for Inca Sun Virgins. More recent examination of the bones by physical anthropologist John Verano dispelled this idea, showing a more balanced ratio of women to men, as well as the presence of children and the elderly. The collection of archaeological artifacts in the collection of Yale's Peabody Museum was the focus of an intensive reinvestigation by archaeologists Richard Burger and Lucy Salazar, who began looking at the Bingham collection in 1982. Their research refuted many of the previously held beliefs concerning the purpose and function of the ancient Inca city, and culminated in a traveling exhibit entitled "Machu Picchu: Unveiling the Mystery of the Incas," as well as the 2004 publication of a book of the same name. Archaeological evidence put forth by Burger and Salazar, and research on early colonial documents, indicate that Machu Picchu was more likely a country retreat town for Inca nobility. It is estimated that a maximum of about 1,200 people resided in Machu Picchu when the royal entourage was in residence, and probably only several hundred lived in the town otherwise. Many of the bodies found appear to have belonged to artisans, such as metal workers and potters, who were a diverse mix of people from throughout the Inca Empire. The circumstances leading to the abandonment of the site are also somewhat of a mystery. The inhabitants left the city around the time of the Spanish invasion of Peru, but there are differing opinions as to whether or not the Spanish ever set foot in Machu Picchu. The fact that the Intihuatana stone is intact led some to believe that the Spanish were never at Machu Picchu, as they destroyed most similar stones in other Inca cities. Based on this evidence, speculation arose as to why the inhabitants chose to abandon the city. Others argued that the lack of valuable gold artifacts, the inoccupation of all the elegant tombs, and evidence of severe fires indicate that the Spanish did, in fact, discover Machu Picchu. Without definitive evidence either way, no explanation has been agreed upon. Machu Picchu is located about 62.14 miles to the northwest of Cusco, at an altitude of approximately eight thousand feet above sea level, and is located on two peaks: Machu Picchu ("Old Peak") and Huayna Picchu ("Young Peak"). Far below is the Urubamba River, surrounding the site on three sides. The climate is temperate and humid, typical for the eastern part of the Andes Mountains. The site was most likely chosen for its beauty, as well as the proximity to a natural spring. The area surrounding the city is filled with many diverse species of flora and fauna. In particular, there are over 50 varieties of orchids, and numerous llamas. The forests surrounding Machu Picchu have been declared a "sanctuary," and are protected along with the city itself. 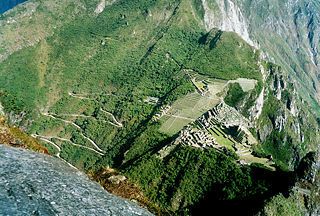 Machu Picchu is divided into two main zones: the agricultural sector and the urban sector. The agricultural zone contains more than three hundred terraces, which provided nearly six hectares of land that made farming possible on the mountainside. There are also small dwellings and storehouses present in the agricultural sector. The urban sector is divided into two main zones: the Hanan (upper) Sector to the west, which contains the Royal Palace, the more sacred spaces, and the Intihuatana; and the Urin (lower) Sector to the east, which contains the Crypt of the Condor, the Palace of the Three Doors, the eastern mausoleum, as well as a great number of dwelling units. The buildings and areas of the urban sector are connected through a series of narrow stairs and paths, with the Main Plaza separating the upper and lower sectors. The Royal Palace faces the entrance of the Royal Mausoleum, and is surrounded primarily by gardens and terraces. There are areas thought to have housed sentries, and a ring set in the wall that is thought to have secured a guard animal. The palace has a canal of water and a water supply, as well as areas thought to be residential, hygienic, and a multi-purpose hall with many niches in the walls. The Torreon, also known as the "Temple of the Sun," is the area where Pachacuti is thought to have been mummified and entombed. A semi circular structure of fine ashlar surrounds the crypt, which is carved out of rock. If the crypt did indeed hold the body of the Inca ruler, there would have been a golden statue in his likeness in the Torreon. 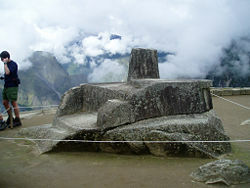 The Intihuatana (literally "tie the sun," more commonly referred to as "the hitching post of the sun") is believed to have been designed as an astronomic clock by the Inca. The Hanan Sector also houses a temple called the "Temple of the Three Windows," named for its distinctive trapezoidal windows. Behind this temple was found a large amount of shattered pottery, including many cups and jars, which suggest some sort of ceremony that involved the throwing of vessels. Nearby, the Main Temple of Machu Picchu stands with its fine polygonal stonework. Behind the Main Temple, a set of stairs leads up to the Intihuatana (also written Intiwatana), or "hitching post of the sun," which can also be accessed from the Main Plaza. The sculpted rock stands 6 feet high and rests on a series of carved levels. It is believed that the stone was likely used as a calendar, as well as possibly serving an astronomical purpose. Near the stone are three small buildings, which likely served as shelter for guardians of the stone. Regardless of the use of the whole city, the Intihuatana and other places related to the sun clearly had religious significance to the Inca, dedicated to Inti, their sun god and greatest deity. A small cluster of houses to the north of the Urin Sector, as well as the "Palace of the Three Portals," may have had some connection to the Royal Palace, due to its location and type of construction. The purpose of the houses and the Palace of the Three Portals is somewhat unclear, but it is likely that, they served as dwellings. Several terraces below, there is a group of eight buildings, mostly subterranean or semi-subterranean, which are believed to have been a mausoleum for important personages. Across from the gardens of the Royal Palace is the Crypt of the Condor, a group of carved caves that may have been used to hold mummies, or may have been used for religious purposes. The presence of a granite carving of a condor indicates a religious purpose, as the condor is one of three sacred Inca animals. North of the caves there is an altar carved from stone, as well as three niches in the walls. Many have suggested that these niches, which have a means of fastening something to the rock wall, were used as prisons or torture chambers. However, archaeologists claim that there is no evidence to support these imaginative ideas, and the niches may equally well have been used to hold mummies or golden images. 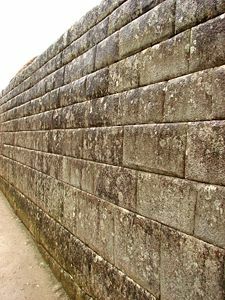 The Inca were experts at a type of stone construction called "ashlar," in which stones are dry fit together so perfectly that not even a knife blade could fit between them. This type of construction was used in areas where the rock would be visible. In other areas, walls were made of more rustic hewn stone and either plastered or stuccoed over. Many dwelling units had two stories, and most likely had thatched roofs. The Inca used a trapezoidal shape for windows and doors, and doors likely were hinged at the top in order to be propped up by wood when open. Despite their lack of a written language or the use of the wheel, the Inca were remarkably advanced in their understanding of drainage, construction, and hydrology. Buildings and terraces were constructed over foundations made from layers of gravel and rock, and drainage systems were designed to keep water from damaging the buildings or their foundations. The city's water supply came from a natural spring (an essential aspect of the site selection), but the Inca engineers built a spring collection system to enhance the yield of the spring. A series of 16 fountains were engineered to carry water first to the Royal Palace, then down through other areas including the Torreon, ending with the last fountain in the Temple of the Condor. From there, water was carried to the main drain through an underground stone channel. Well planned drainage systems are essential to the longevity of a structure. Modern engineers have examined Machu Picchu's drainage system, and have found that the city was expertly designed to handle waste water as well as rainfall runoff. Drainage holes were installed in walls and structures, and drainage channels built into stairways, walkways, and building interiors carried excess water to the main drain. Channels were carved into buildings to serve as gutters and direct water away from foundations. Despite a lack of iron or steel tools, the Inca created a monument that is as technically impressive as it is breathtaking, and has stood the test of time. Machu Picchu has become one of Peru's most famous attractions, attracting hundreds of thousands of tourists every year. Some visit to see the impressive and beautiful ruins, and others are attracted by Machu Picchu's purported connection to sources of spiritual energy. The site can be reached by taking a train to nearby Aguas Calientes, then a bus to the ruins, or by the longer, more traditional four day hike from Cuzco along the Inca Trail. The trail is part of the ancient Inca road system, a system which included nearly 14,000 miles of road and stretched from Ecuador to Chile; an engineering marvel in itself. As is the case with any popular archaeological landmark, there has been concern about the damage tourism causes to both the site and the surrounding areas. Stricter rules have been enforced along the Inca Trail; for example, hikers are mandated to traverse the trail in groups with a guide. ↑ Andrew Mangino, Elections could avert Peru's lawsuit Retrieved June 20, 2007. ↑ 2.0 2.1 Luis G. Lumbreras, The Colonial Occupation. Retrieved June 20, 2007. ↑ Luis G. Lumbreras, The Palace of Three Portals. Retrieved June 20, 2007. ↑ Luis G. Lumbreras, The Crypt of the Condor. Retrieved June 20, 2007. ↑ Kenneth R. Wright, Machu Picchu: Prehistoric Public Works. Retrieved June 21, 2007. ↑ Jeff L. Brown, Rediscovering the Lost City. Retrieved June 21, 2007. This article draws heavily on the corresponding article in the Spanish-language Wikipedia. Retrieved August 8, 2005. All links retrieved August 6, 2018. Google Maps. 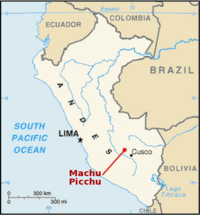 Map of Machu Picchu. Quechua.org. Quechua Language and Linguistics. Gutierrez, Antonio. Machu Picchu Lost City of the Incas. 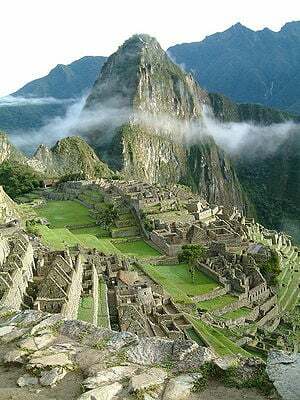 Machu Picchu Travel Agency. Machu Picchu. This page was last modified on 6 August 2018, at 16:30.